This topic provides an overview of Brightcove Video Connect for the Sitecore Experience Platform. Supports Video Cloud Sitecore 9.0. 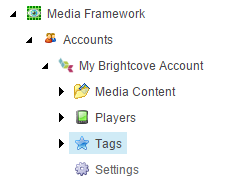 Separate installation of Media Framework no longer necessary; Media Framework is included in the Brightcove package. Supports Video Cloud Sitecore 8.1 with Media Framework 2.1 v150625, Video Cloud Sitecore 8.2 rev 161221 with Media Framework 2.2 rev 160927. Licensed under the Apache License, Version 2.0 (the "License"); you may not use this file except in compliance with the License. You may obtain a copy of the License at https://www.apache.org/licenses/LICENSE-2.0. Unless required by applicable law or agreed to in writing, software distributed under the License is distributed on an "AS IS" BASIS, WITHOUT WARRANTIES OR CONDITIONS OF ANY KIND, either express or implied. See the License for the specific language governing permissions and limitations under the License. This topic covers the installation process for the Brightcove Video Connect module. Brightcove Video Connect requires Video Cloud Sitecore Media Framework to be installed first. 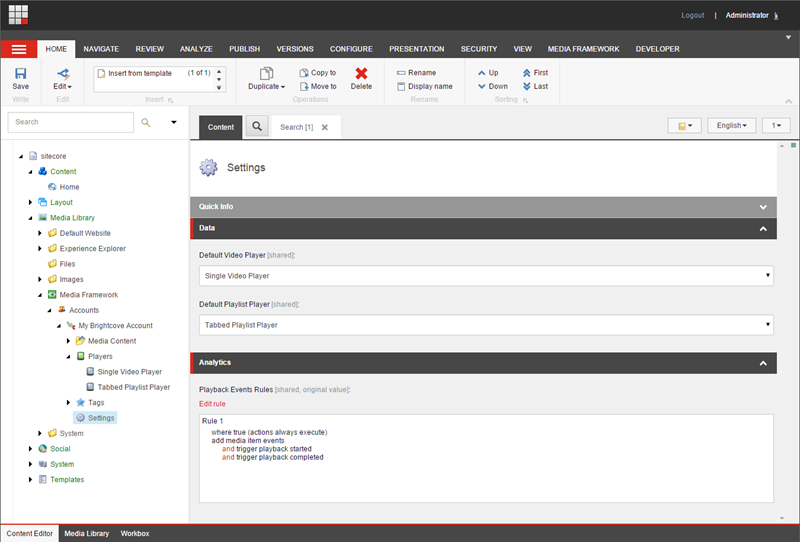 The Video Cloud Sitecore Media Framework is installed using the Video Cloud Sitecore Installation Wizard. Follow the instructions displayed by the installation wizard. The Video Cloud Sitecore Media Framework includes a number of page events that must be released from workflow and published before they can be used. Brightcove Video Connect for Video Cloud Sitecore is installed using the Video Cloud Sitecore Installation Wizard. Follow the instructions displayed by the installation wizard. The Video Cloud Sitecore plug-in is available for download via a link in the table above. This zip file includes both the source and the plug-in package. Unzip it first and then upload the internal zip package to your Video Cloud Sitecore instance. In order for the Video Cloud Sitecore Media Framework reports to work, a new fact table must be added to the Experience Database (xDB) reporting database. A script that will create this new table is available on SDN. You must run this script on your xDB reporting database. This step should be completed by your database administrator. Note: It is possible to install multiple Video Cloud Sitecore Media Framework connectors. This script only needs to be run one time per reporting database, regardless of how many different connectors you have installed. If you are using the scheduler to synchronize media, only one content management (CM) server needs to have the scheduler configured. Remove the scheduled job from the config files on the other CM servers. The Video Cloud Sitecore event queue will handle keeping the other CM servers in sync. Note: Configuring the scheduler on multiple CM servers will not cause a problem, but there is no benefit to doing so. On each content delivery (CD) server remove the following index from the specified config file. This index is only needed in the CM environment. When configuring CD servers you may find it convenient to copy config files from a CM server. If you do this and you have added a scheduler to synchronize media you should remove the scheduled job from the config files on the CD servers. Media synchronization should not run on the CD servers. It should run on one CM server. Publishing is used to make the media items available on the CD servers. This topic covers how to create an account in Video Cloud Sitecore that corresponds with a Brightcove Video Cloud account. In order for Media Framework to connect to Brightcove Video Cloud , the account credentials from Brightcove must be added to Video Cloud Sitecore . 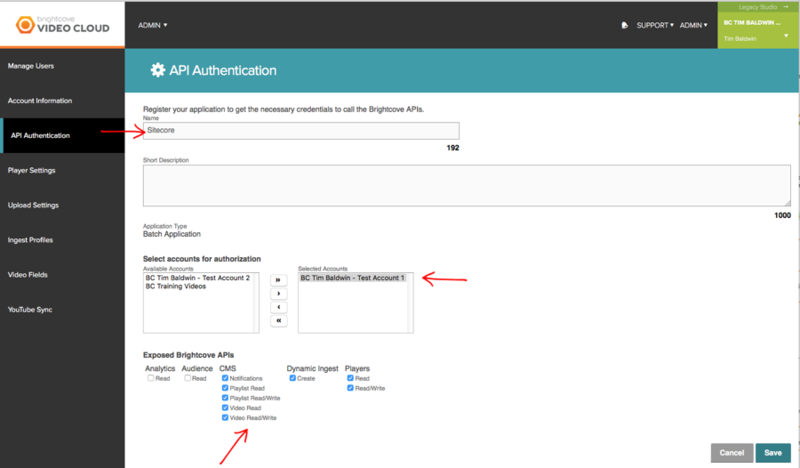 This section describes how to locate the account credentials in Brightcove. The following section describes how to add those credentials to Video Cloud Sitecore . Log into Brightcove Video Cloud . Note the Publisher ID value. You will need to enter this into Video Cloud Sitecore in the following section. Name the application, set account access, and enable APIs. 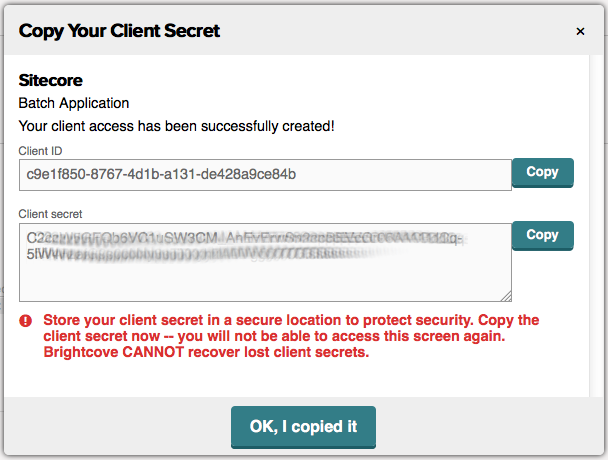 Note the Client ID and the Client Secret. You will need to enter them into Video Cloud Sitecore in the following section. This section describes how to add a Brightcove account to Video Cloud Sitecore . Log into the Video Cloud Sitecore Desktop. Navigate to Media Library > Media Framework > Accounts. Add a new Brightcove Account item. Enter the Publisher ID, Client ID and Client Secret values noted in the previous section. A player is needed in order to display a single video or a playlist of videos. A player defines what kind of capabilities are available to the visitor who wants to watch a video. Video Cloud Sitecore Media Framework allows content authors to add new players, edit existing players and delete existing players. This section describes how to manually create the Video Cloud Sitecore item that corresponds to a player. In Brightcove Video Cloud , navigate to the Players section. Select the player you want to create in Video Cloud Sitecore . Note the Player ID value. You will need to enter this into Video Cloud Sitecore in the following section. 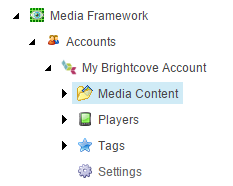 In Video Cloud Sitecore , in the Media Library, select the Brightcove Account item. Add a new Brightcove Video Player item. You will be prompted to enter the player ID. Enter the value from Brightcove Video Cloud . In order for videos and playlists to be previewed in Video Cloud Sitecore , the default players must be specified. This section describes how to set the default players. Set the values for the Default Video Player field and the Default Playlist Player field. Player items are edited just like any other Video Cloud Sitecore items. Player items are deleted just like any other Video Cloud Sitecore items. Note: Deleting a player from Video Cloud Sitecore will not result in the player being deleted from Brightcove Video Cloud . Video Cloud Sitecore Media Framework allows a content author to upload videos from his local machine, as well as to edit and delete existing videos. New tags can be defined to organize video content. A Video Cloud Sitecore content author or administrator can manually trigger the media import process. When you import videos, Video Cloud Sitecore will reflect the current day that the videos were imported rather than the upload date inside of Video Cloud . If you are moving a previously existing Video Cloud Sitecore implementation, you can migrate the previous content and the connector will recognize these videos. Display the Media Framework ribbon by right-clicking the top-menu and selecting Media Framework. 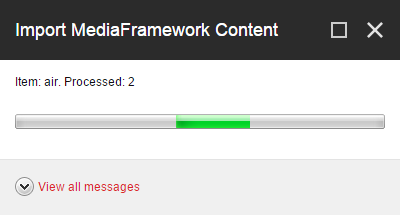 Click the Media Framework ribbon. Click the Import All button. As the import process runs, a status box appears. When the status box disappears, the import process is complete. To confirm media has been imported, click the Search tab. Video Cloud Sitecore Media Framework allows content authors to add new videos. Open the Video Cloud Sitecore Media Library. Navigate to the account with the videos you want to create a playlist for. Navigate to the Media Content item. Select the file you want to upload from your local machine. After the video is uploaded, close the uploader window. Video Cloud Sitecore Media Framework allows content authors to add new tags. Navigate to the account with the videos for which you want to create a tag. Navigate to the Tags item. Enter an item name. This will become the tag. Video and tag items are edited just like any other Video Cloud Sitecore items. Video and tag items are deleted just like any other Video Cloud Sitecore items. Videos and playlists can be found by searching for text strings in their name and descriptions. Videos can also be found by searching for text strings in their custom fields. Click the Search tab to search for media. Enter text to search for in the name or description fields. Click the magnifying glass to perform a search. Search results can be filtered by type, such as video or playlist, by date and by other attributes. A playlist is a collection of videos in a single player. Video Cloud Sitecore Media Framework allows content authors to add new playlists, edit existing playlists and delete existing playlists. When you import playlists, Video Cloud Sitecore will reflect the current day that the playlists were imported rather than the create date inside of Video Cloud . If you are moving a previously existing Video Cloud Sitecore implementation, you can migrate the previous content and the connector will recognize these videos. Video Cloud Sitecore Media Framework allows content authors to add new playlists. Navigate to the account with the videos you want to create a playlists for. Add a new Brightcove Playlist item. For the Name field, enter a descriptive name for the video. For the Video Ids field, select the videos you want to include in the playlist. Playlist items are edited just like any other Video Cloud Sitecore items. Playlist items are deleted just like any other Video Cloud Sitecore items. Video Cloud Sitecore Media Framework allows content authors to insert media into their pages in a variety of ways. This chapter covers the options that are available. Rich text fields allows content authors to insert formatted content into their pages. Content authors use the rich text editor to create and edit this formatted content. This section covers the features that Video Cloud Sitecore Media Framework adds to the rich text editor. Media can be embedded directly in a rich text field. In the rich text editor, click the Embed Media button. Use the search screen to find the media you want to insert. Click the row that represents the media you want to insert. Click the Next > button. Depending on the type of media you select, you will see additional options. For example, if you select a video, you must specify the player that should be used to display the video, along with the dimensions for the player. Click Finish. The media is embedded in the rich text field. A link to media can be inserted in a rich text field. In the rich text editor, click the Embed Media Link button. Enter a value for Link Title. This is the text that will appear for the media link. In addition, depending on the type of media you select, you will see additional options. For example, if you select a video, you must specify the player that should be used to display the video, along with the dimensions for the player. Click Finish. A link is embedded in the rich text field. Renderings allow content to be positioned at a specific location on a page. 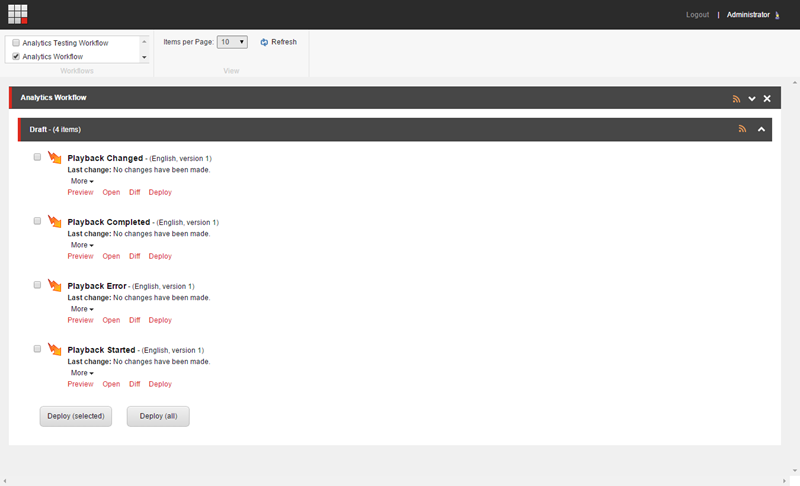 Video Cloud Sitecore Media Framework includes a rendering that allows content authors to insert media in pages. Use Page Editor to add a rendering to a placeholder. Select the Embed Media rendering. The rendering has been added to the placeholder. Now click the Embed Media Element button. The media has been selected for the rendering. Importing from Brightcove to Video Cloud Sitecore was covered previously here. Within Video Cloud Sitecore , Brightcove media is accessed using Video Cloud Sitecore items that are created during the media import process. Since they are Video Cloud Sitecore items, it is possible for users to change those items. The media export process is responsible for exporting changes from Video Cloud Sitecore to Brightcove. When a Video Cloud Sitecore item that corresponds to Brightcove media is created, saved or deleted in the Video Cloud Sitecore client, those changes will be pushed to Brightcove. When a new media item is created in Video Cloud Sitecore , a real time export is performed by default. This means that the export task is performed immediately. You may not want changes made in Video Cloud Sitecore to be exported to Brightcove. You may want the connection from Video Cloud Sitecore to Brightcove to be read-only, where Brightcove changes are imported to Video Cloud Sitecore but where Video Cloud Sitecore changes are not exported to Brightcove. Note: This setting applies to the Video Cloud Sitecore Media Framework, not just the Brightcove Video Connect plug-in. Changing this setting will apply to all connectors and all accounts. Cleanup processes are used to keep Video Cloud Sitecore and Brightcove data in sync. Video Cloud Sitecore cleanup is the process that runs when media is deleted in Brightcove and the corresponding Video Cloud Sitecore items must be deleted. Since Brightcove knows nothing about Video Cloud Sitecore , Brightcove cannot notify Video Cloud Sitecore that media has been deleted. Therefore, Video Cloud Sitecore must be proactive. Brightcove cleanup is the process that runs when a media item is deleted in Video Cloud Sitecore and the corresponding media in Brightcove must be deleted or disabled. Since Brightcove knows that the media item was deleted, Video Cloud Sitecore is able to notify Brightcove that the corresponding media in Brightcove should be deleted or disabled. When a media item is deleted in the Video Cloud Sitecore client, an entry is made in the export queue. The process is the same as when a media item is saved. The Video Cloud Sitecore Media Framework allows video playback events to be recorded for use in the Video Cloud Sitecore Digital Marketing System (DMS). This section covers the options that are available. Playback events are used to record DMS page events as the result of video player actions. For example, when video playback starts, a DMS page event can be written. By default, the playback started and playback completed events are recorded. This is enabled on the Settings item under the Brightcove Account item. The Settings item has a field named Playback Events Rules. A rule is defined that tells the Media Framework to record the events that are specified under videos and playlists. All playback events can be disabled for a specific account. In Content Editor navigate to the account under Media Library > Media Framework > Accounts. The Playback Events Rules field describes the conditions that must be met in order for playback events to be registered. By default, the condition is "where true", meaning "always". Click the Edit Rule button to change the condition, or to remove the existing rule. Each playlist and video item has a field named Events. This field determines which playback events will be handled for the specified item. Note: Standard Values can be used to ensure certain events are recorded for all playlists and videos, but the field also allows individual playlists and videos to have their own events selected. Note: These events will only be recorded if the Settings item under the Brightcove account item has its Playback Events Rules field configured to with the "add media item events" action. See section 3.1.2. You can add new playback events in order to capture more detailed information about video playback. Note: Remember to assign the new playback event to your playlist and videos. Otherwise the event will not get recorded. The Video Cloud Sitecore Media Framework includes a number of reports that pertain to video playback. This report shows a list of the videos that have triggered the video started event. This report shows a list of the videos that have triggered the video completed event. This report shows a list of the videos that have triggered the video started event but not the video completed event.